Got a shiny .45 ACP pistol and want to feed it the best? Federal 230 gr HST Overall Best: Defense 14.0" .85"
Speer 230 gr Gold Dot Longer Barrels: Defense 12.9" .71"
Federal +P 230 gr Tactical Bonded LE Higher Pressure: Defense 14.6" .86"
Read on to see how we chose our recommendations of the best ammo for home defense and target shooting. Plus a couple places to buy it for cheap! The .45 ACP is a slow moving but heavy round that is well-known for its stopping power. 1911 anyone? The 9mm has caught up with new bullet technology, but there’s no disputing that a big fat round will still do some serious damage. 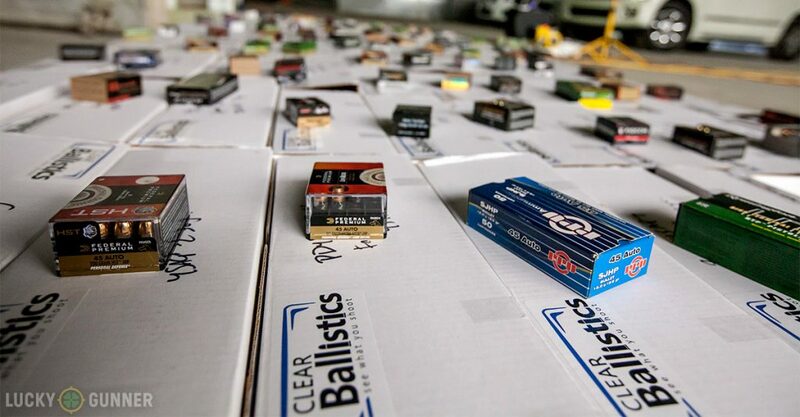 One of our favorite places to buy ammo from, Lucky Gunner, ran an epic test of self defense ammo. We condense it down into the absolute best .45 ACP ammo from the results. Ideal penetration of 12-18 inches. 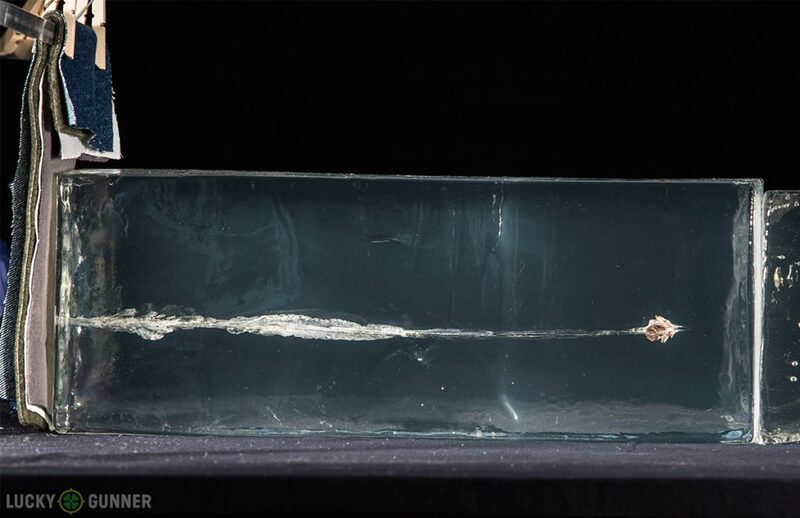 More than 18 inches might go completely through the baddie and hit something you didn’t intend on hitting. While having a 12 inch minimum protects against thicker than usual targets and the possibility of hitting something before the torso. More compact gun. 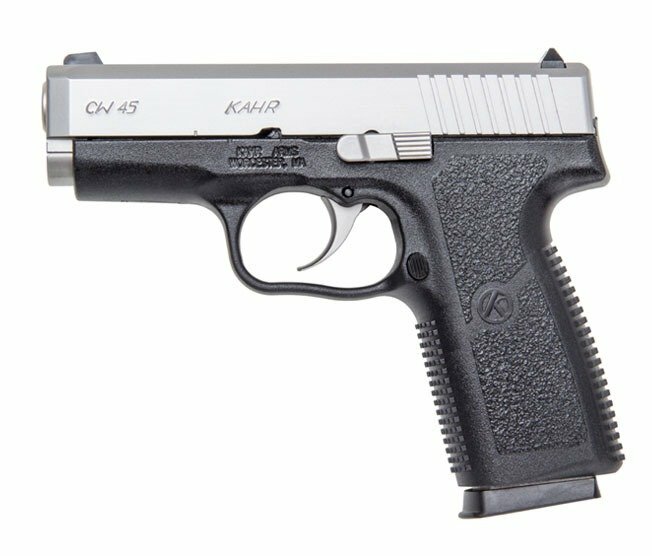 Most tests are run with a full-sized pistol but Lucky Gunner used a compact Kahr CW45 with a 3.64″ barrel compared with a 5″ barrel of full-sized guns. The reasoning is that most defensive situations might entail smaller guns and because of the smaller barrels, the velocity drops a little bit from the manufacturer’s data. 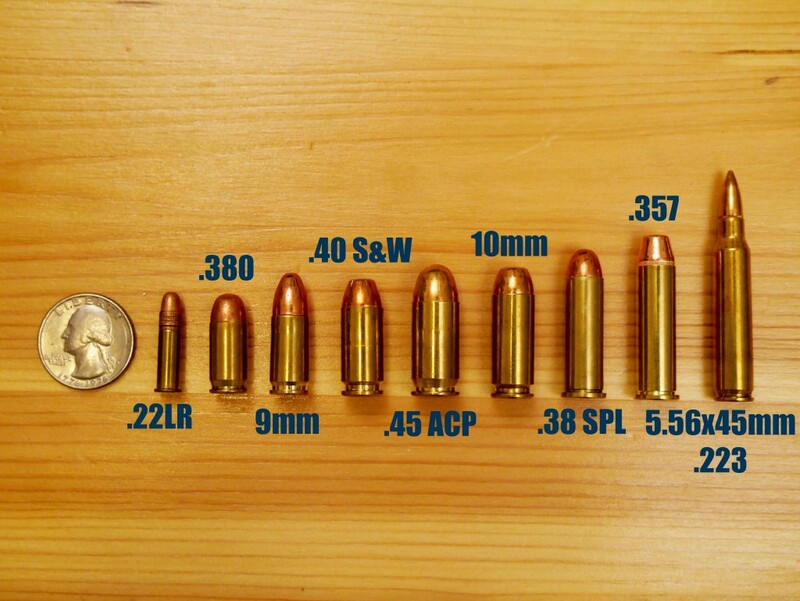 While with other calibers that have more variance of standard bullet weights, we stuck with the most popular 230 gr .45 ACP round because it’s the weight that we shoot 100% of the time. Note, if you’re using a 1911 (and you should always try your self-defense ammo anyways), please test out a bunch of self defense ammo to make sure the jacketed hollow points (JHP) feed. Some 1911’s are finicky and only like full metal jacket (FMJ/ball) ammo. And why JHP rounds for self-defense? Expansion is always better since it transfers almost all of the energy into the baddie and prevents most over-penetration. Penetration depth is right in the 12-18″ sweet zone, with great expansion on all five rounds, and good velocity for a shorter barrel. Since the penetration is an average of 14″, this round would likely be fine (no over-penetration) in longer barrels as well. My personal favorite brand (Federal HST) and what I use in my 9mm too. What’s your take on the HST? Penetration is slightly less than the HST which may suit it better for longer barrels. Expansion is still great and velocity is slightly lower, which probably affects the penetration. If more pressure/velocity is the name of the game for you, I recommend this newer round. Great penetration, awesome expansion, and slightly higher velocity due to the +P (but not by much). Law Enforcement model. Now how about the best .45 ACP ammo for practice and the range? I’ve shot a lot of .45 ACP through my 1911 and here are a few of my favorites that always fed well and went bang! I stay with brass cased name brand ammo since I had bad luck with steel-cased and cheaper ammo. Great deals last year but I feel there’s still a surplus. So now I’m starting with AE first. Usually the cheapest brass cased round in other calibers. But always reliable and good to go. Brass is a little hard to reload so it’s great if you are at a range or class where you can’t pick up spent brass. My go to brand for range shooting ammo. Sometimes ends up cheaper than Blazer and is great brass to reload. If you want to see the full results from Lucky Gunner, check their post out here. So there you have it…our recommendations for the best self/home defense and range target shooting ammo. Let us know which ones you went with and how they run in your gun. Or head to our Ammo & Reloading section for more! Eric, I just traded for a Kimber CDP Ultra II. What do you recommend with the 3” barrel in .45 Auto ammo? What is the threshold for what is considered a longer barrel? 4+ or 5+ inches? My choices were the same as yours again choosing the Federal Ammunition. However, Winchester has some 45acp hollow points with some impressive credentials My 1911 Colt doesn’t not fuss about whatever I shoot in it. From personal and professional experience (30 years OCSD), your 45acp review is spot on!!! Wondering why Winchester Ranger-T wasn’t mentioned? 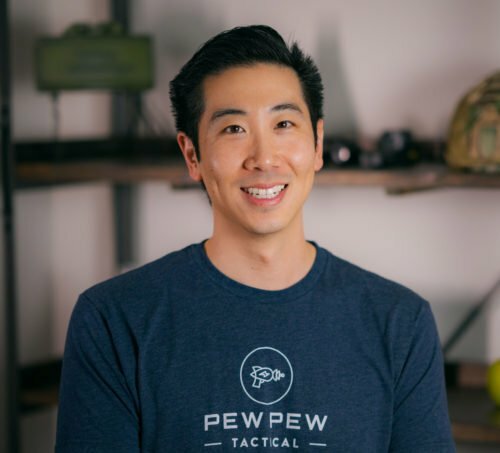 It currently seems to be a little hard to find but if anything, according to the Lucky Gunner data, it meets if not surpasses your testing criteria when compared to the home defense rounds mentioned here. Just an honest question, no bias here. Hi Joel, that one might have been recently added to their list (says ***NEW*** next to it)…we’ll be updating soon too.